With experience of over 7 years, I am very passionate about placenta remedies and am committed to continuing to provide excellence in this area of expertise. I never cut corners when it comes to proper cleaning and sterilization techniques. I work closely with other Doulas, Midwives, local hospitals AND have a very smooth process for retrieving placentas. The relationships I have with hospital staff are of utmost importance and I continue to build bridges and make strides in this specialized area of healthcare. ​I am truly honored each time a Mother chooses me to provide these services for her. ​Thank you for referring me to your friends and family! The placenta is made for you, by you, and holds key nutrients and hormones that are perfect for replenishing your depleted body during the postpartum period. The placenta is dried, processed and encapsulated to make consumption effortless. Steamed - Placenta is steamed prior to slicing. It is then dehydrated and ground into a powder. The powder is then placed into capsules (we use Vegan gelcaps). Raw - Raw Placenta is sliced, then dehydrated. The dried placenta is then ground into a powder and then placed into capsules (we use Vegan gelcaps). ​Retrieval of your placenta at agreed-upon location. Proper transportation and storage of your placenta. Preparation of your placenta as specified by you. Hand delivery of completed capsules to your home (or mailed). ​Cord keepsake upon request FREE. Placenta Print(S) upon request FREE. 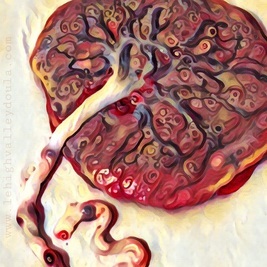 ​"Electronic" Placenta Prints for your personal use on the web (blog, social media, etc). Full color brochure/directions will be provided. Follow up via email or phone for 2 weeks after delivery. You may contact me at any time with questions throughout the length of time that you're using the capsules. Most placentas yield between 75-250 gelcaps. Dosage is subject to the method chosen for encapsulation. You will receive your finished product within 2-3 days. I pride myself on speed, however sometimes there may be a delay, especially if I have a high volume of births. I never process more than one clients placenta at a time. Capsules will keep for a period of 2 years with proper storage. *Repeat clients receive $25 off! Prints: Using acid-free archival paper, we can capture the beauty of your placenta for a lifetime. Prints are done with food-grade dye, safe for consumption. Size is 11x14 and can be framed and hung in your child's room or kept in a scrapbook. FREE or $30 without PES. Once your baby is born, please contact me to set up a time to pick up your placenta. Typically, the local hospitals release placentas within 24 hours. If you are purchasing Placenta Encapsulation Services in addition to Birth Doula Services, generally, I will be able to take your placenta home after your birth. Sometimes hospital regulations do not allow me to remove the placenta from hospital premises immediately after birth, so other arrangements will be made. If your placenta will not be able to be retrieved for more than 48 hours, I request that it be frozen until I can begin the process of encapsulation. More information will be given once you have contracted with me for services. I follow OSHA & EPA guidelines for blood-borne pathogen transmission, infection control & standards for sanitation, and safe food handling. Disposable equipment is used when possible, and other equipment is thoroughly cleaned and disinfected for each client. Some conditions, including infection, may not be compatible with placenta consumption. Please contact me for more information. ﻿The information on this page has not been evaluated by the Food and Drug Administration. The services offered by us are not clinical, pharmaceutical, or intended to diagnose or treat any condition. Families who choose to utilize the services on this page take full responsibility of their own health and for researching and using the remedies.